Greece’s’ breathtaking landscape and wealth of unique ecosystems is a superb setting to provide ecotourism experiences. With one of the most abundant and diverse flora and fauna in Europe, a wealth of agricultural areas, iconic mountains, unpolluted rivers, and exceptional habitats, Greece is a perfect magnet for eco tourists all year round.From the untamed mountains of Epirus and picturesque Macedonia to the dramatic gorges of Crete, Greece presents a wide spectrum of natural beauty and unusual animal life to the agritourism-seeking visitors. Travelers of the world are showing an increasing interest in ecotourism practices and agro tourism is becoming one of the most dynamic sectors of the thematic tourism market. Based in rural areas and centered around agricultural lifestyles, agrotourism in Greece focuses on developing a closer relationship with our natural environment and the people and communities who inhabit and make a living off the land. Agrotourists live and often work alongside local residents, learning about agricultural practices in a “hands-on” approach, one that generates income for agrobusinesses or host families, and opens a world of educational opportunities for visitors. Agrotourism draws visitors to local festivals and celebrations and spurs the production and sale of local products, and creates strong cross-cultural social bonds. Moreover, agrotourism is a good match with other forms of thematic tourism such as adventure and sports tourism, religious tourism, and historical and wellness tourism. Greece offers amazing opportunities in this growing market, which offers holiday experiences in dedicated agro villages or the chance to create new products, incorporating local traditions and customs. 1000.gr is dedicated to facilitate and establish a relationship of trust for those seeking socially and environmentally responsible vacations, who also look for authentic, comfortable, customized, private and unique travelling experiences in Greece. Working With The CattleHelp with picking olives using any of a number of age-old harvesting techniques, and with transferring them to a traditional olive press; initiate yourself into the traditional art of extracting the precious oil. 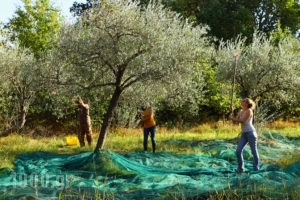 Harvest grapes to make wine or tsipouro, or pick fruits, herbs, and mushrooms. Take part in reaping and learn about bee-keeping by having your own hands-on experience. For those who love animals, getting to know how to take care of them will sure be a challenge. After all, you don’t have the chance to see cattle’s grazing or milking every day! A more gastronomic choice involves participation in the yoghurt and cheese making procedures. In agritourism cooperatives around the country one can take lessons of cookery and pastry and prepare old-school recipes of jams, stewed fruits, spoon sweets, home-made bread, fresh pasta, pies, liqueurs and other delights of the local cuisine. Subscribe to our Newsletter to discover more in Ecotourism opportunities and activities around Greece. 1000.gr is dedicated to provide visitors and travellers valuable agricultural information and ecotourism insights.